Thought Canada’s province was only good for debates and political pandering? Not at all! Ottawa is a beautiful city that is perfect for a little romantic getaway. Start your day off right with the perfect breakfast. For a cozy, underground feel, check out The Manx on Elgin Street. Or, for an exceptionally friendly vibe, pay a visit to the Baker Street Cafe. Everything is made to order, so you will be served up a delicious, freshly cooked breakfast. Once you have satisfactorily fueled yourself for the day, head off for a stroll through the Bank Street shops that are located between First and Fifth. The one-of-a-kind stores are the perfect setting for a romantic walk. Pick up handmade gifts for friends or just enjoy each other’s company as you meander through every kind of artisanal shop you can think of. And for even more stores, and to see the bakery that President Obama visited during his tour, check out the Byward Market. No journey to Ottawa is complete without a visit to the Canal. If you happen to visit in the summer, a stroll along its bridges and pathways is a great way to spend your afternoon. But if you are so fortunate as to go during the winter — well, skating on the Canal is an absolute must. The activity is free if you have a pair of skates; or, if you don’t own any, you can easily rent a pair for a very decent price. Skate along amongst friends, families and lovers and enjoy the brisk Ottawa air. When you’re done, sit down and dig into a Canadian classic called a BeaverTail. It’s a stretched and deep-fried pastry that’s covered in whichever delicious toppings you choose, such as brown sugar and whipped cream. It’s the perfect treat after a day of strolling around. Finish off your stay in Ottawa with a romantic dinner at The Keg Manor. The place was once a mid-nineteenth century house that has since been converted into a restaurant. The old Georgian style gives a whole new vibe to your dining experience. And since it’s a member of The Keg Steakhouse & Bar chain, you get all your favourite dishes in a unique and exciting space. Enjoy romantic music, a stunning atmosphere and delicious food to round off your romantic getaway. Don’t forget, these options are just to get you started. Ottawa is an exciting city filled with galleries and historical sites. Plus, it encourages experiencing the outdoors in any way you like, so bike, run, ski or snowshoe your way through its incredible parks and paths. 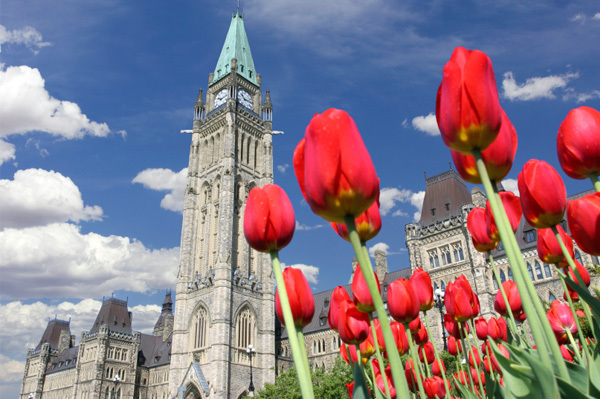 However you want to spend your romantic getaway, Canada’s capital is sure to offer something that fits just right!